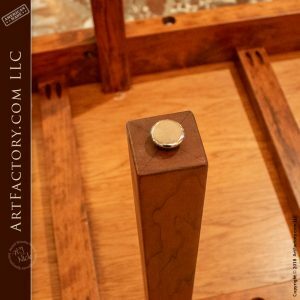 All of our custom furnishings are handmade by master craftsmen using tried and tested old world techniques, and fine grade natural materials. This combination makes for a level of quality that is unmatched anywhere at any price. 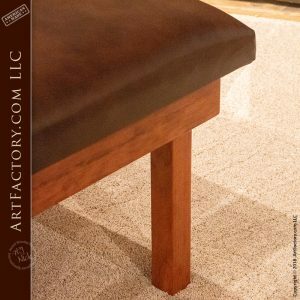 At ArtFactory.com we build custom furniture with top grade materials like genuine, solid cherry wood, fine grade epidermis hide leather, and durable foams and fillers that are firm yet comfortable. The difference is in the comfort. Whether you have a modern interior theme or rustic decor, our custom cherry wood workout bench is a fine art quality custom furniture design that will give an air of luxury to your gym. Our custom chairs, stools, and benches offer the most enjoyable and comfortable seats available anywhere at any price. This custom cherry wood workout bench features full grain, epidermis hide leather upholstery. 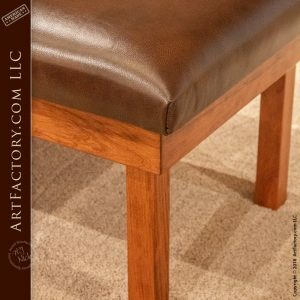 All of our custom furnishings are upholstered with the top quality, high thread count fabric of your choice, or full grain American leather. We also offer unique options such as hair on hide leather that is popular on our western style offerings. The handmade, solid wood bench provides the perfect workout experience. You'll get only the best handmade, hardwood, structural frame, built with hand hewn mortise and tenon joined construction, and rated up to 800 pounds. 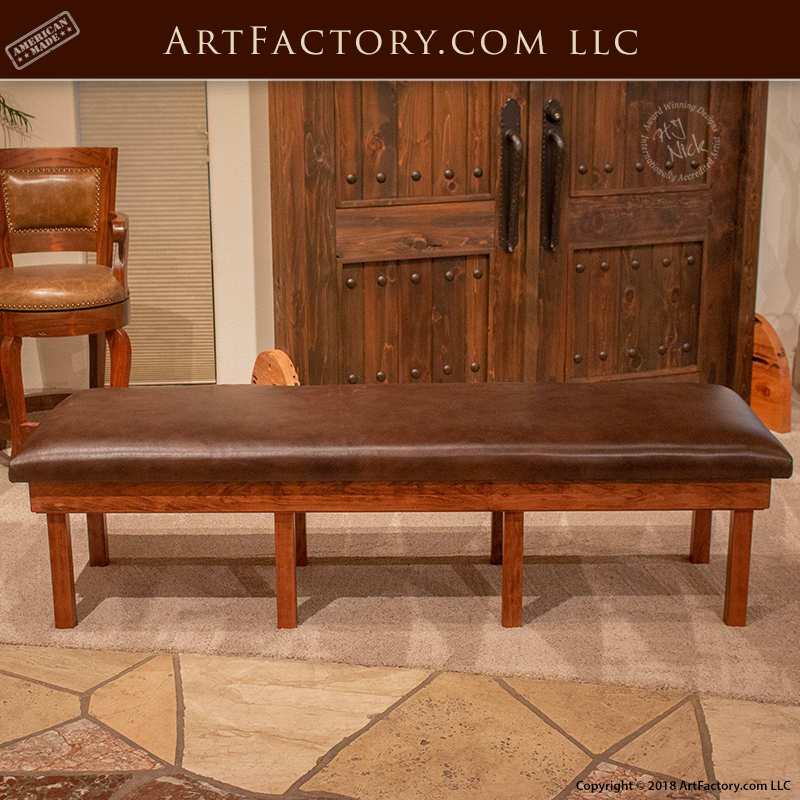 This bench as shown is crafted from solid, old growth cherry wood, by the hands of our master craftsmen. Cushions are stuffed with only the best quality, natural fillings. All of this adds up to a workout bench that is built to stand the test of time, and will never need to be replaced. Don't settle for low quality, foreign made products that are destined to become yard sale fodder. Own invesment quality furishings with future appreciable value that will add to your financial net worth. Building a family legacy has been going on since the beginning of time. Building heirloom furniture intended to last for generations is one of the primary ways we all have in achieving some small part of immortality. These cherished family items will touch our loved ones for many years to come. Many societies, including the Egyptians and Mayans, as well as European royalty and aristocracy have created and passed down heirlooms for thousands of years. In fact, if it were not for these artifacts, it would be impossible to know these people ever existed, how they were important to history. This is also the case in the 21st century within your own family. 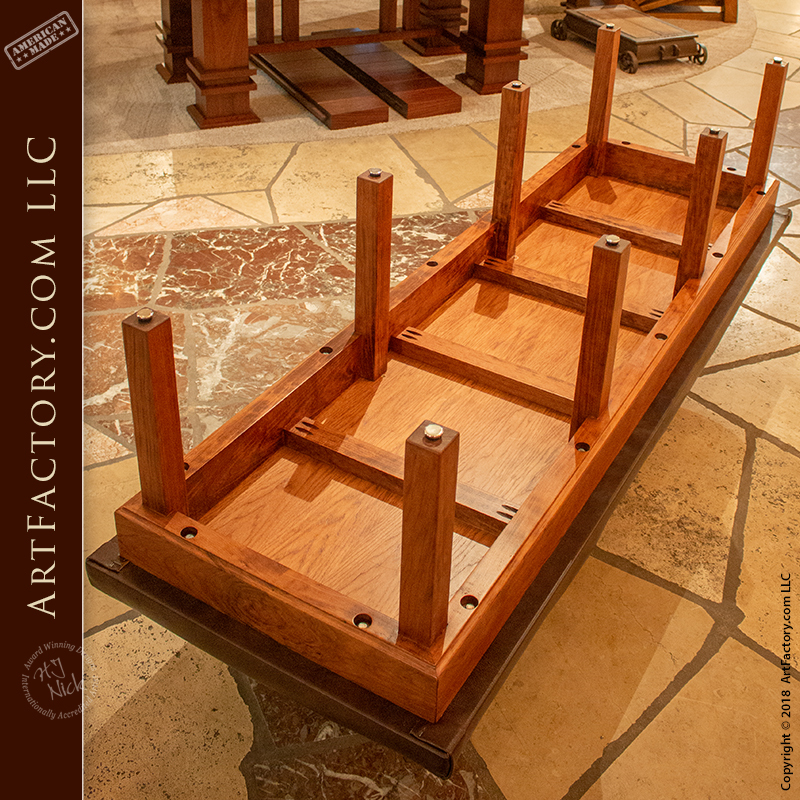 No matter if it's a simple, hope chest with your personal message or name as a gift to a loved one, or an extravagant, fine art quality, custom cherry wood workout bench, these items will be important to the story of your family history long after you are gone. Our custom cherry wood workout bench includes all of the little extras such as mar proof leveling feet that make the difference between ordinary, and extraordinary. Our custom home furnishings are never mass produced. Like all of our products, our custom cherry wood weight bench is an original fine art design by award winning artist H.J. Nick. It is his belief that fine art is never made with fake materials. That is why we insist on using, only, all natural materials like genuine solid wood, natural fillings, and full grain leathers. Each custom product is not only designed by H.J. Nick, but also built under his supervision, and signed as meeting all world class fine art certifications. This signature ensures that your custom cherry wood workout bench is an investment quality product with future appreciable value. If you need more reasons to love the custom furniture designs, we also use a high density memory foam cushion core and super duty coil springs. This ensures superior durability, and that your cushion won't sag or sink in over time as happens with low quality production seats. Additionally, we hand tie the seating elements in all our custom built furniture to create stability you can rely on and dependability you count. We also include all of the little extras, such as mar proof leveling feet with every products. The difference between low quality, mass production products, and world class fine art is in the details. 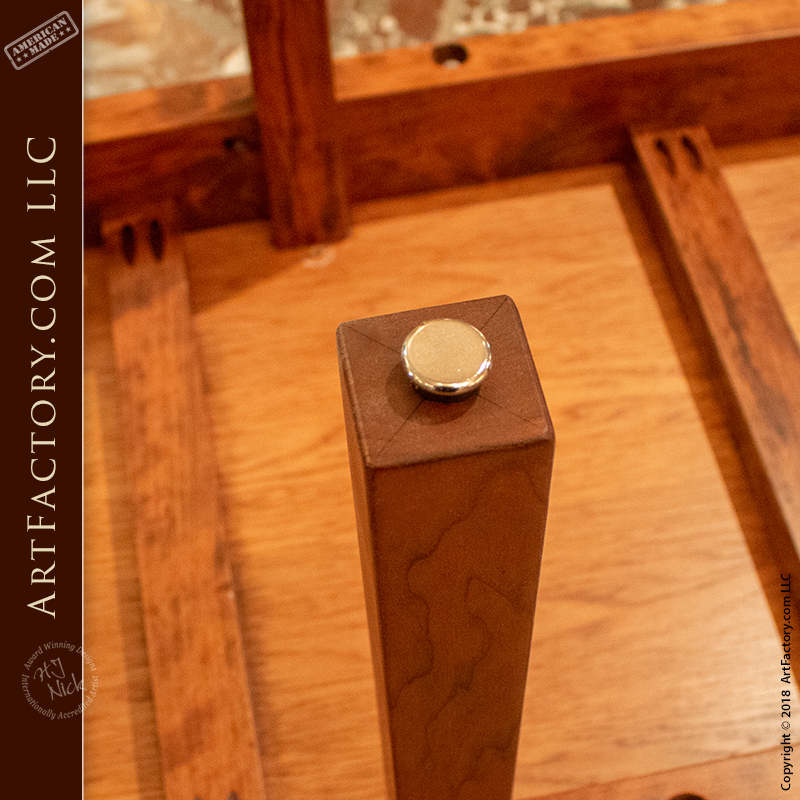 Our fine art quality finish process makes for a finish that is actually part of the wood, not just painted on top, ensuring your product stays beautiful for generations. The meticulous finish has been done in the age old technique using a 23-step hand rubbed process beginning with fine hand sanding, and infused hand applied stains. This allows for the highlights on the reliefs to show to perfection.There are then 20 additional steps requiring the application of wax, oils and lacquers with curing times between each process. This is done on all wood surfaces inside and out. This is the type of detailed required in the making of a one-of-a-kind, family heirloom bed that meets world class investment quality standards. In other words, a true fine art appreciable asset. Our in-house master woodworkers and blacksmiths handcraft all custom furniture to your design specifications. We only use the highest quality materials. All of our wooden furnishings, doors, and gates are made from solid, full length, naturally air dried timber. 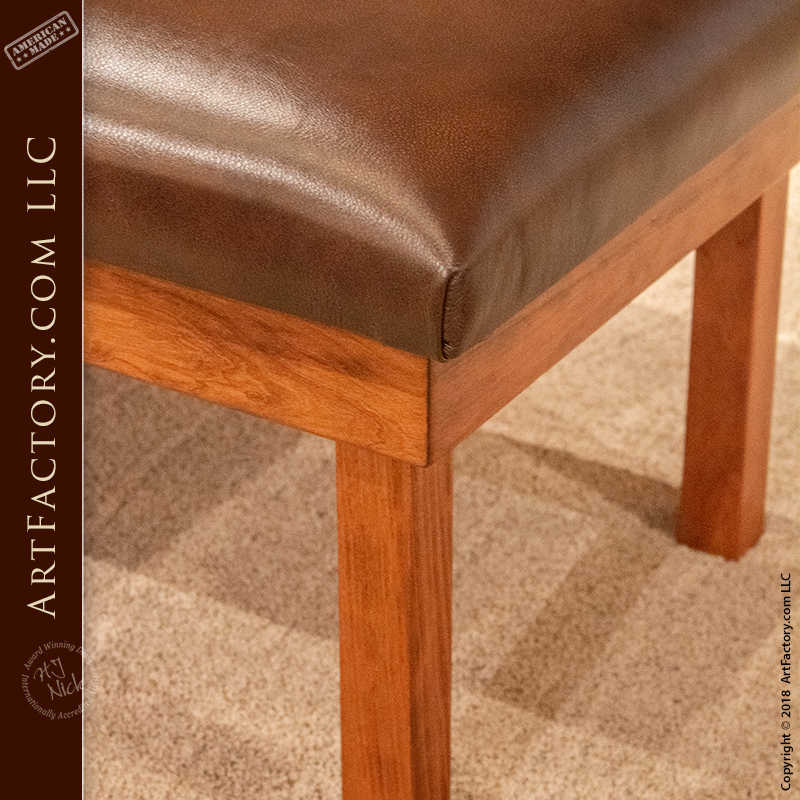 We believe in the quality of our products in craftsmanship so much that as result, our custom furniture and all of our products are guaranteed forever. Call now for a custom quote at 1-800-292-0008 and get started on the custom cherry wood workout bench of your dreams, or any other custom furniture project. Like all of our products, this bench was handmade in the USA, in our Scottsdale, Arizona factory.